The intrigue begins with the third overall pick in TSN Hockey's Mock Draft, with the Arizona Coyotes taking Erie Otters centre Dylan Strome and the Toronto Maple Leafs taking London Knights winger Mitch Marner fourth overall. As mentioned in our scouting report, Marner - the best winger in the draft - has exceptional creativity with poise and passing skills that allow him to create offence quickly. The Leafs also have the 24th pick in the first round and are pegged to take Gabriel Carlsson from Linkoping of the Swedish League - a big, rangy, good-skating defenceman. Toronto would be getting best of both worlds by taking the uniquely skilled Marner at No. 4, and bolstering the defence corps with Carlsson at No. 24. At No. 15, the Calgary Flames take Colin White of the USA Under-18 team, who has all the makings of a solid second-to-third line centre. With Connor McDavid locked in at first overall, look for the goaltender-needy Edmonton Oilers to select the first goaltender of Round 1 in Ilya Samsonov. The run of Canadian teams continues with the Winnipeg Jets at No. 17 and No. 25, adding Cape Breton winger Evgeny Svechnikov and Kelowna forward Nick Merkley to their already deep and talented crop of prospects both skilled and highly competitive. With the 18th overall pick, the Ottawa Senators should take Saint John Sea Dogs blueliner Jakub Zboril. The Vancouver Canucks are at No. 23, selecting Tri-City defenceman Brandon Carlo while the Montreal Canadiens select big winger Brock Boeser. Check out the full mock draft for Round 1 below. 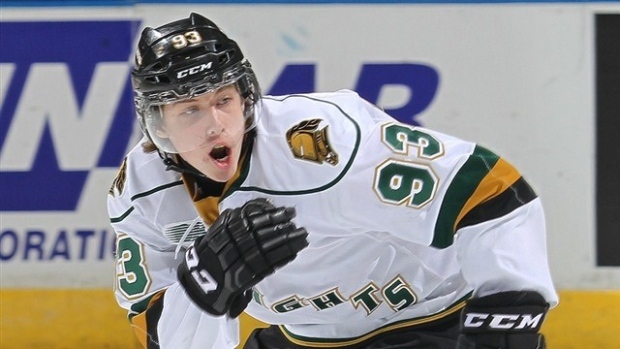 The final edition of the TSN Hockey's Mock Draft will be posted on Friday.